As this is the spring issue of Hyakunin Issho, you know what you will find inside - a story on the annual exhibition, of course! It was no problem for me to write the little report, but taking the photographs to go along with it was difficult. Those of you who were there know why! 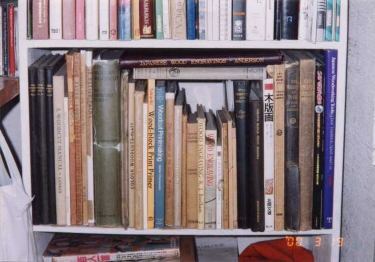 I also introduce you to the 'magic' bookshelf here in my workshop ... Do you believe in ESP? Well how else can you explain the fact that without leaving your own home, you can now look right inside the printmaking books that are on my shelf, and read every word of them! Thank you again for reading 'Hyakunin Issho'! The branch office of the music shop where I was now to start working was in a bit of a disorganized state; it had been established a couple of years earlier, but had already had two managers. Bill had asked me to take on the job perhaps in part because he knew that I understood the business well, having worked for him previously for three years. I arrived just at the beginning of the busiest time of the year - the opening of the school season - and there were many things waiting to be done. Some of the staff members were friends of my family, so it was easy to settle in. Because I was new to the concept of being a 'manager', I collected lists of questions, things I needed to ask the head office about. Then, at a suitable time each day, I would phone Bill and go through the items one by one. In the beginning, he was sympathetic to this; he listened to my questions and responded with advice or directions as needed. But one day, maybe it was a couple of weeks after I had been in the job, his voice on the telephone changed suddenly. "What are you doing bugging me with these questions all the time! I hired you to be manager. Well, start managing!" He was right of course. I had gradually fallen into a pattern of asking somebody else what to do instead of thinking for myself. But after this little episode I gradually got better at the job. I worked at trying to get the place organized as well as I could, and then once there was some time for it, I started to try and implement some of the programs and policies that I had seen the head office doing back in Vancouver when I had worked there. Becoming more involved with the company's management this way gave me quite a different perspective on how things worked, and it was during this time that I started to think about how our business could perhaps be helped by a computer. This was 1979, before the era of the personal desktop computer, and to think about a computer was to think about a large room-filling machine. Such a thing didn't really seem practical for our small business, but in order to learn more about them I made an arrangement with a computer company to lease a terminal. This was not a computer itself, but just a keyboard and display unit that connected by telephone to a large computer downtown. Using this I gradually became familiar with fundamental concepts of programming and data management. Then a bit later, I took to going downtown in the evenings to the place where the large computer was operated, to 'rub shoulders' with it, and drink in what knowledge I could. Those of you who read this who were at my final exhibition for the Hyakunin Isshu series more than a year ago know that I experimented with a different way to display my prints there. I created a small area away from the bright lights of the gallery - a place where the prints could be seen under a soft 'raking' light. All during the following year, I remembered how beautiful the prints in that room had been, and I thought about how I could recreate that feeling for the entire exhibition next time. When it came time to start preparation for the first exhibition of the new Surimono Albums, I thought of a way to do it ... It would take a lot of time and effort, and it would be expensive, but I thought that it would be worth a try, and went ahead with the plan. As the guests came in the door, instead of seeing the usual brightly lit gallery with prints hanging on the walls, they faced a dark room with a row of softly glowing shoji screens stretching away into the distance. Was this a gallery ... or was it a Japanese restaurant? 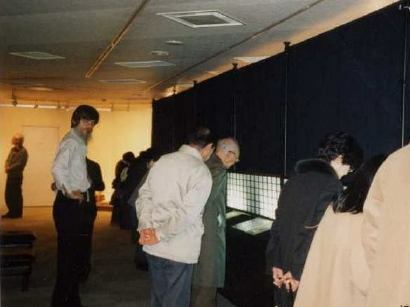 But once they were inside and drew closer to the display, they were able to read the small notice placed there: "Under what kind of lighting conditions were people back in the Edo-era able to look at woodblock prints? We have re-created it here for you ..."
The set of 10 completed surimono prints were mounted on cards and simply placed in front of the screens, along with a short 'essay' for each one. No frames, no glass, no bright spotlights. Another small card told the viewers: "Please feel free to pick up the prints and examine them closely ..." And this they did ... It was very gratifying to see people enjoying close contact with the prints and being able to see them properly, with all the soft colours and embossings visible. Compared to last year's rather special exhibition (at the completion of the ten-year Hyakunin Isshu project), this year's show was quieter and less exciting. But the media gave me excellent coverage, and attendance was far better than I had any right to expect. As usual, I refused to show people the designs that I have selected for this coming album. I very much want subscribers to be surprised when each print arrives, so it's always 'no peeking'! This means though, that I have to ask everybody to "Trust me! I'll be making interesting prints ...", and as always, some people find it difficult to do that ... But the Surimono Album was received very well, and again I was very pleased to find that a good number of the attendees wished to subscribe to my work for the upcoming year. So there was the end of another year of interesting and productive work. By the time you read this, work on the current year's series will be well under way. And of course, the gallery is already booked for next January. Time is running out - got to get busy! Any person living here in Japan who wishes to begin making woodblock prints has a very easy time of it, as there are many sources of information on how to get started. 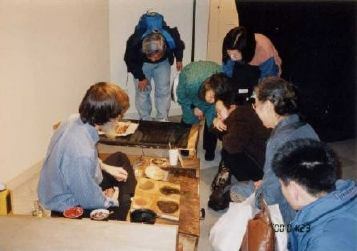 Those who want to work with a 'guide' can join a class at a local culture centre, while those who would rather work alone can head for their local library and check out a stack of 'how to do it' books, or even easier, can turn on their TV and tune in to the printmaking programs on NHK's education channel. But for people in other parts of the world things are a bit more difficult. Some books on printmaking are in the bookshops, but they are mostly about etching, lithography or other modern processes - not woodblock printmaking. 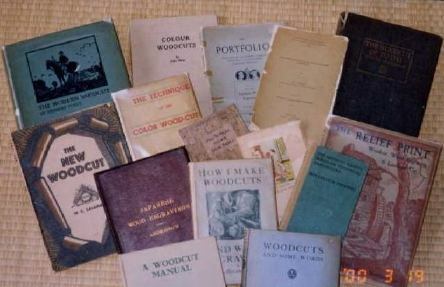 Over the years there have actually been a number of very interesting and useful books written about woodblock printmaking, but because they had never been 'best sellers' when they were new, they are now extremely difficult to locate. Here's one example: in the early 1890's, the Japanese government made a gift to the U.S. National Museum of a complete set of printmaking equipment, including carving and printing tools, pigments, blocks, paper samples - everything involved in the process of making prints. In addition to the materials themselves, illustrated written descriptions of many aspects of the craft were included, and these descriptions were published in a detailed pamplet issued by the Smithsonian Institution in 1892. 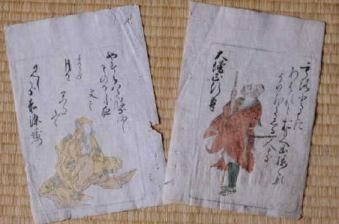 This pamphlet is now rare indeed, and is very expensive and extremely difficult to obtain. The very interesting information is thus 'locked up' and inaccessible by printmakers. Until now, that is. For this pamphlet, every word of it and every single illustration, is now up on the internet on my website where it can be read by anybody with an interest in its contents. A couple of years ago I started to search for these 'classic' books on woodblock printmaking, and have been able to track down quite a number of them. On my website there is now a complete 'Library of Books on Woodblock Printmaking', more than twelve volumes in all, including a large group of 'how to' books. Simply by sitting at their own computer screen, anyone can now go to my website, and can read these books and look at the illustrations, just as though they were holding the actual volume in their own hands. But isn't this illegal? What about copyright laws? Well of course, I have no wish to 'steal' other people's work. But copyrights do have an expiry date, and all of the books in my 'Library' are old enough to now be in the public domain. There are no barriers, either legal or moral, to copying and distributing this information. Are these books in my Library actually being 'borrowed' and read by anyone? One interesting thing about an internet website is that it is possible to keep track of how many people view each part of it. 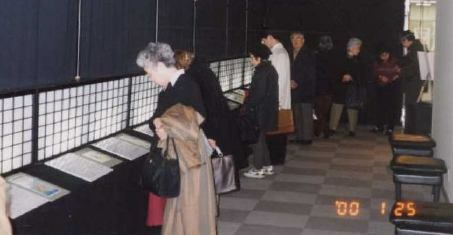 In the relatively short time that these books have been up on the internet more than 1100 copies of these books have been downloaded in their entirety by interested viewers who wanted to keep a copy on their own computer, for reading and study at their leisure. I receive a lot of mail from these viewers, many of whom have told me just how much they appreciate the information, and how much their work has improved as a result. Even as I am sleeping here in Japan this evening, some young potential printmaker on the other side of the world will be 'clicking' his way through one of those interesting books, his eyes growing wider and wider as he learns more about this wonderful world of woodblock printmaking. Perhaps he will gather together some tools and materials, and start cutting ... Just what sort of prints he will make I cannot tell, and indeed, that is not my concern. For me, it is enough that knowledge and experience is being passed on to eager learners. That is an important responsibility of an experienced worker in any field, and I am very happy that I am able to do this with my printmaker's Library. I myself was strongly influenced by a particular book that I ran into in the early days of my interest in this craft, and I suspect that I am not unique. Just how much influence this library will have on the world of printmaking is not something that can be easily measured, but I like to think that it might be very wide indeed. The books in my library are actually sitting right here on a shelf in my workroom, but their contents are visible from anywhere in the world ... What magic! 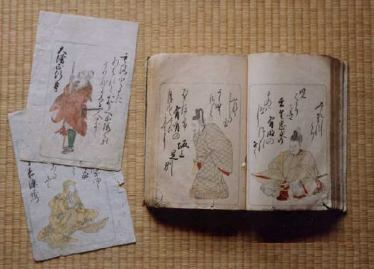 And so my copy of the Shunsho book, which had been damaged by the removal of two of the pages, perhaps many many years ago, has finally been returned to 'normal', through the kindness and courtesy of this man, who at no point during our email conversation discussed money or asked for any kind of payment. I was only able to send him a few of my recent prints as a 'thank you' gesture. A year ago in the spring issue of this newsletter I showed a few pictures from the final exhibition of the Hyakunin Isshu series. You were able to 'meet' the members of my family who had come over to Japan for the event. The Bull family had a bit of a 'reunion' during that exhibition, something of a rare occasion for us ... This coming June though, we are getting together again, but not because of my event - it will be my parent's fiftieth wedding anniversary. We will be meeting in Canada, and this time, every member of the family will be there. And when I say every member, I mean every member - all my relatives will be present. I'm curious though - in your case, how many relatives do you have? Dozens? Hundreds? You may be a bit surprised to find that I have only six actual relatives - my two daughters, my two parents, one sister, and one brother. You see, both my parents were 'only' children, and I thus have no uncles, aunts or cousins. And to keep things down even more, neither my sister nor my brother have children, so I have no nieces and nephews either. But my trip won't just be for the reunion; I'm going to be taking a box of woodblock printmaking tools along with me as well. But let's save that story for the next issue ... See you then!